Commissioned in 1952 by the Dallas Housing Authority, Brackins Village became a potent element to Meyer’s architectural repertoire. Although the most well-known buildings are single-family residences clients of middle to high social status, the architect through his work in the Brackins Project revealed a responsibility to social welfare. 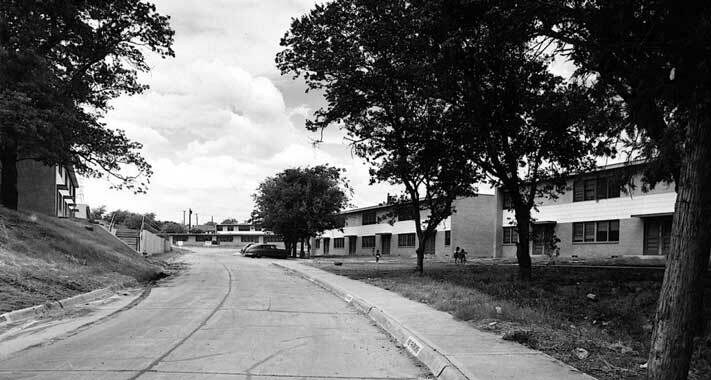 Commissioned in 1952 by the Dallas Housing Authority, Brackins Village became a significant element to Meyer’s architectural oeuvre. Whereas private homes allowed a greater use for luxury materials and exquisite, yet often-costly details, Brackins Village would bring Meyer to a test in terms of his aesthetic methodology. The 14-building complex with a 102 dwelling units indicates Meyer’s core principals of making architecture that is befitting of the client while addressing popular techniques and community-centric living. The construction of Brackins Village came at a time when public housing initiatives and the idea of arranging ‘suburbia’ were at their peak. With the completion in 1951 of the renowned Hampstead, New York hamlet, Levittown, the rise of the winding street and free standing ubiquitous home and lot arrangement began to take hold across the United States. Brackins Village emulates this newfound planning mechanism as it reinforced sense of community within the heart of the city.